Getting applause from stiff crowds can be our toughest challenge as magicians. Not anymore! This is a cute, playful, and effective way to up your applause. Cue cards have been used for years in the TV business. 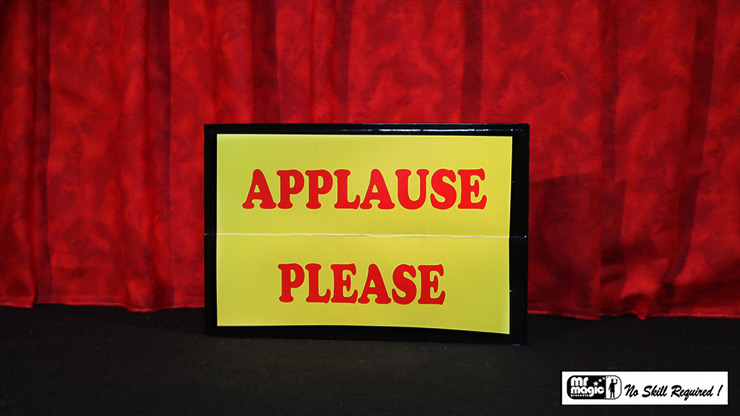 Now you have a fun, magical way to introduce an "Applause Please" cue card to your performances. The magician brings out the "Applause Please" card to cue the audience to clap. The audience will follow instructions and politely clap. The magician turns over the card where it boldly says, "Louder." As the audience claps louder, the magician takes a bow and turns the sign over again. "Applause Please" has magically changed to "That's Enough." The audience is amazed with the change and laughs at the not-so subtle instructions.